I am not a fan of bananas but every now and then for my kids I make banana muffins, banana bread (quick bread), banana pancakes and cakes, and banana milk shake and smoothie just to remind myself why people like bananas. Whenever the bananas in my house have gone sesame (ie, growing freckles), the motherly cook's instincts in me start eyeing on them. I never force my kids to eat any fruit or vegetables. That's why the house ends up having so many unlikely combinations of chutney and jams. Now, I have not come across bananas in a savory, or at least non-sweet, combination with flour. What if I inject that lovely banana flavor (not to me!) 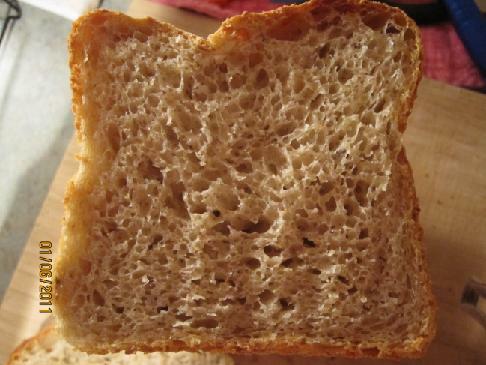 into the crumb of a sourdough bread and use it for sandwiches or just toasts? Would it work? No harm trying. Step one: I started with four very large ripe bananas (475 grams). My idea was to use bananas as hydration for final dough. To puree bananas in my blender efficiently, I need to add some sort of liquid, and I chose to add 20% of banana weight in water (95 grams). I got 570 grams of banana puree. In addition to that, I had 100 g of diced banana to put in separately. Step two: To decide on a dough hydration percentage. I picked 65%. For this I needed to make an assumption as to the solids to liquid ratio in the bananas - my guesses were 35% to 65% (like pumpkin). Step three: To calculate how much flour and starter that I would need for the given amount of banana puree. Step four: To work back to see if the figures match up before starting on the dough. Well, was I in a hurry? I didn't go through Step Four properly. 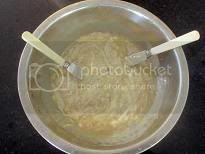 Immediately after I got the preliminary flour and starter figures, I poured my banana puree over the starter eagerly and began mixing!! Total dough weight was 1.8 kg and approximate dough hydration was 80% (not 65% as I set out to do)**!! No wonder the dough felt very wet and sticky and 3 sets of stretch & folds were needed during bulk fermentation for dough strength. This dough was very difficult to shape. An ample dusting of flour on the work bench and quick, swift movement and minimalist handling during shaping were necessary. Bulk fermentation 2 + 1/2 hours with 3 sets of stretch & folds of 30 - 40 strokes each, including autolyse of 20 minutes. Divide into two doughs of 900 g each. My daughter said this bread smells heavenly-banana. 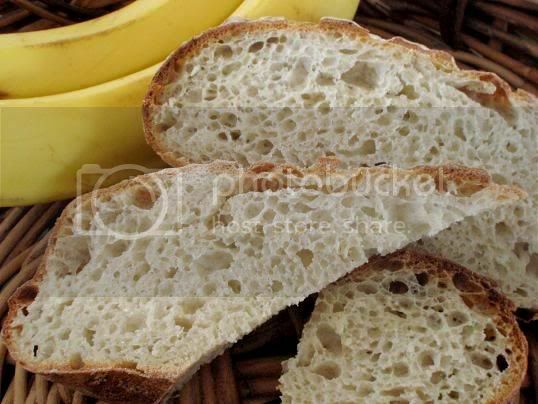 I don't know if that is possible but I have to admit that, for a person who doesn't like to eat banana, I find this sourdough very delightful. It is incredibly moist - a slice of this bread on your palm weighs heavily. The effect of bananas on dough is probably not dissimilar to potatoes on dough. It is also very chewy and sour (at least medium strength of sourness to me). There was no trace of the sweetness from bananas left in the bread. 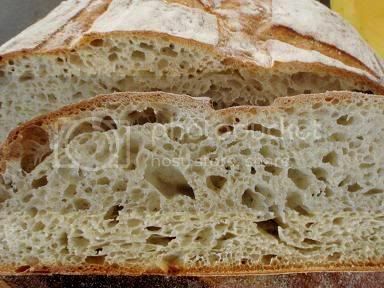 If it is done right, I believe the simplicity of this formula allows the natural flavor of fermented flour come through and it is in the spirit of what Pain au Levain is about. Now that is the most sophisticated banana bread I have seen to date! : ) Looks superb! I just baked this bread after using my day yesterday to prep it all. It it incredible. 5 loaves going to downtown Chicago today in CSA orders. Woot woot. Thank you for this delicious recipe and I will be including it in my repertoire of breads here at the Boomerang. Really makes me miss home after reading the discussion about banana benders and making this bread. Lived in Flying Fish Point and then Oonoonba (Townsville). Had banana palms, coconuts, mangos, bush lemons, pineapples, mandarines, pumelos, rosella, guava, and you-name-it growing in our backyard. All the fresh fruit you can imagine. Now I have to buy at a grocery store. Another one joins the queue! Those pics look amazing, Shiao-Ping, and the bread sounds lovely. I'm curious about this one. I regularly make a sourdough banana bread, but it's quite sweet, with walnuts and sometimes sultanas in the mix - closer to a cake or slice than a bread. This one of yours, on the other hand, is not sweet, and very much a bread. You do realise that I feel compelled to try almost all of your breads, don't you? Twice to three times per week is not enough to keep on top of my queue of must-try breads. You are keeping me very busy! When this banana pain au levain was on my drawing board, I did consider using walnuts. Like carrot cakes, banana cakes often have walnuts in them (and sultanas as you said). 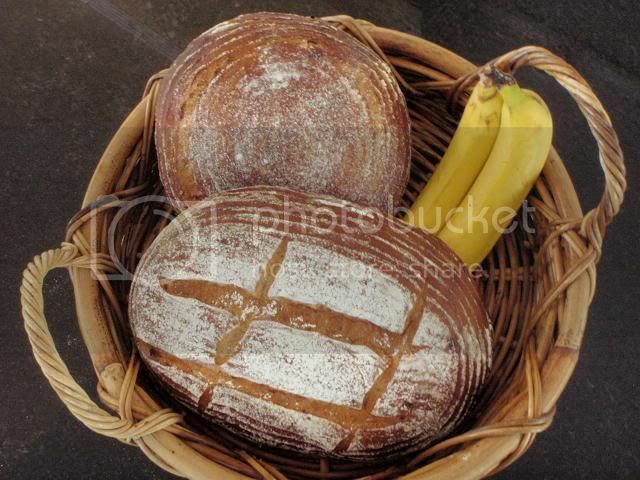 You mentioned that your sourdough banana bread is sweet, that means you just throw in some sourdough dough into the batter for extra flavor and that it is not there to leaven the bread, whereas this banana pain au levain is a pain au levain where banana is used as hydration. So, all things considered, they are two different breads. What is the % of sugar in relation to flour in your sourdough walnut banana bread? 15 - 20%? I too regularly made banana bread (in my pre-sourdough days). 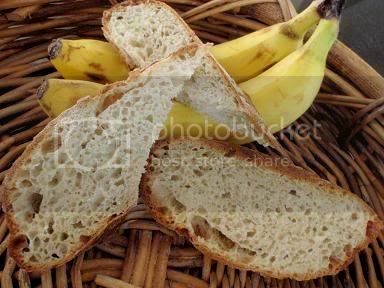 I don't know if you are one for exotic spices but Pierre Herme has a beautiful banana bread recipe using coriander powder, which eccentuates and compliments banana flavor in a very unexpected way. I made it once and I threw in fresh coriander herbs (now I know it's almost not possible to picture a sweet banana bread with fresh coriander herbs). A mate of my husband's and his son came around for a cuppa and, boy, didn't we all enjoy that coriander banana bread! Hi Joanne, I would love to share that recipe except that I don't have that recipe book with me any more. In memory, all it is is that a teaspoonful of coriander powder is added to a banana bread recipe. When I made it, I chopped up fresh coriander leaves and added those in as well. Try it; you may like the flavour. I love your creativity when it comes to bread making. Another keeper! I would love a taste of this bread. It reminds of years ago mixing a banana bread recipe from my bread machine recipe book. It wasn't a quick bread but a banana bread and was very delicious without any sweetness from the banana but had the banana flavor. Your recipe must be wonderful and far surperior to the recipe I tried! That recipe you described sounds very similar to my banana bread here. Bananas and mangoes are my favorite. This sure is a more sophisticated way of doing banana bread and will try it one day. Lovely blog as usual (content wise and shot-wise). A mango infused sourdough bread sounds great. Why don't you try making a Mango Pain au Levain when mango season is on? You know in summer, restaurants often have mango prawn cocktail salad in their menu. If you make a mango sourdough bread, you can have an open sandwich with thin slices of mango and prawns on top. A yogurt lemony dressing would be great for this. thanks for that suggestion, but as you may have guessed, i have not yet started my journey into sourdough, that's for my 2010 agenda. i did make a mango bread once with mango pulp. it was decent, yes, but nothing to gloat about. maybe i'll post it here one day. my dream is to be reach your level of sophistication, but life sometimes happens and i can't fulfill all my dreams, i'd need two - maybe three - lifetimes to do all what I want to do! 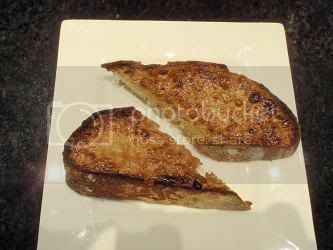 Great Bread and a great post you are doing the banana benders proud( for the benefit of other TFL readers Aussies call Queenslanders banana benders). 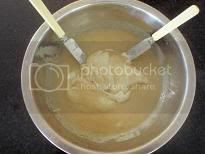 I often use a mashed banana when making cinnamon scrolls as a bit of a paste for the cinnamon to stick to, better than water as it dosent runout if you are a little generous with the brush. I do quite like the thought of the mango bread mentioned but as they are only just appearing in the shops here that will have to wait a while. In the meantime i will probably have a go at a straight dough banana bread probably at about 25% to 30% banana content to see if the taste remains.i will probably keep to the local Canarvon bananas they are smaller and sweeter than the queensland ones. I did make an Avacado dough with the fruit off next doors tree a while back at the rate of 25% fruit, ( is it a fruit or a nut?) it turned out quite nice as dinner rolls very moist and a slight tinge of green and just a hint of avacado flavour. thanks for your feedback. 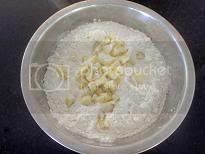 My banana to total flour was 64%; ie, 2/3 flour (counting the flour in the starter as well). If you are using instant yeast in your straight dough formula, you might want to consider using a higher percentage of banana. I am assuming you are not prefermenting any flour (my pre-fermented flour was 36% of total flour). I think instant yeast would be very happy in a banana dough. p.s. I didn't know Queenslanders are called banana benders. Is it because of the abundance of bananas in Queensland? With the recent growth of pupulation in Queensland, bananas are insufficient to meet demands and apparently they apply either chemical or other artificial treatments to speed up the ripening of bananas; quite worrying to me. If you asked any West Aussie who banana benders were they would reply Queenslanders,i guess we figure you have lots of bananas there and someone has got to put the bends in them, so it keeps you all rather busy. I did google BANANA BENDERS and there were several rather unpleasant references! Certainly none of them were implied by me, or by fellow West Aussies toward the othersiders,Relly i think it is a term of endearment for the folk that perform the tedious task of shaping the fruit for us. We of course get refered to a Sandgropers, but i think we will leave it there. Rolled oats like moisture too! And here would work like little sponges. I love Oats and Bananas and Peanut butter! Peanut butter with sliced chilies, grilled? Oh and I firmly believe that sensible people have more pictures of bread than relatives! My starters are ready to go! Had muffins this morning but forgot the sugar. I used diced plums with Cointreau spelt and sprouted flour. Dusted the tin with chopped hazel nuts. Honey is too overpowering so.. I'm thinking... jam. Grape? How would a PB & J be with B SD? Sensible people have more pics of bread than relatives??!! I love that (except that you forget Chinese people have more relatives than they have anything else)! Cointreau spelt? Are you making an alcoholic spelt? Oh I get it - you are talking about the muffins; that sounds lovely. You are talking a million miles an hour. Peanut butter with sliced chilies... sounds like the Thai sweet chilie sauce that I make for my son (with sugar added). You think your starter can take the chilies? PB & J would be super on B SD, grilled. This sounds really good. I want to make this sometime soon! This posting has led me down a strange path...;-) as you can see at my current blog: (The link to which, TFL thinks is spam ) Try a search on TFL for "Banana saga". Thank you for posting your fabulous recipe, Shaio-ping. I have wanted to make banana bread as yours someday after I saw Ron's blog " Banana Saga"
I made a loaf of your banana bread using my raisin yeat water that is my favorite yeast. The hydration was more than 85%. I couldn't shape it at all. So I put the dough in a loaf pan. As you describe, I tasted a lot of banana heavenly in my loaf that was really tasty. 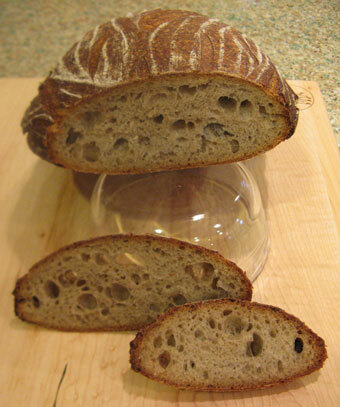 Great looking crumb, Akiko. I guess that wonderful color was from the Raisin Yeast Water ? Your banana loaf is amazing. Thanks for posting the picture here. It's wonderful for me to see what raisin liquid yeast can do for a banana bread. Your "yeast water" is a complete new frontier to me. Thanks. I surely have to give this a try since I always have bananas laying around. I can't wait - thank you for sharing your recipe. I guess when you add the pieces of bananas - did you taste it at all? I was randomly reading through threads just now and found this discussion on bananas and rising times. I know you ran into 'sluggish' dough with your loaf and mentioned being a bit puzzled by it. I thought you might like reading through the thread and seeing if any of it can apply to your situation despite the fact that the poster is using commercial yeast for his loaves. Interesting to read but no solution as of yet. I know my sourdough loaves baked the way you outline above have always turned out GREAT. Rising times have been okay...nothing out of the ordinary for me but I have always used very ripe FROZEN bananas. Hi Janet, thanks for the link. Do you mean you use FROZEN bananas defrosted to room temperature? You both might find this of interest. I have since done a lot of investigation into the use of Wild Yeast Water levains. Now, I often use a 300% banana levain (that is the natural hydration of a pure banana culture) not only in breads, but all by itself as a desert. I have yet to find any fruit levain that has a strong flavor to survie in bread baking, and the most fruit flavor that I can achive to past through the baking is the fruit added that is not fermented. As I found, Shiao-Ping's fourmula, did give me some banana flavor, but only with very over ripe bananas added in unfermented condition at the final mix stage. 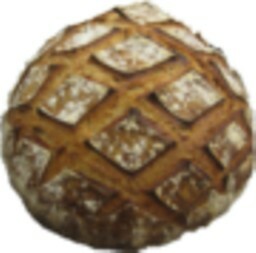 I had wanted to also give you the link to my "Levain as Desert", but as often happens, I could not find it. I think I will try to never make another "comment" that has any detail to it, and do such that do, as blogs. 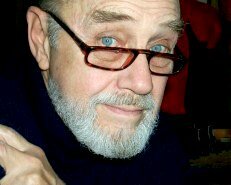 A Big Thank you, Ron, for your Banana Saga write-up and the link here. It is very informative. You went through a lot of interesting experiments. I'd like to read it in details for my own education. Thank you. At the time of my initial posting, I left you a comment about it, but it turned out you had gone off-post already. Many of us have done a lot of yeast water experimentation since then. I find it very interesting. Yes, I weigh out the amount I need - 285g - while still frozen the night before I mix the dough and I let them defrost in my refrigerator. In the morning I heat them a bit in the microwave to take the chill off before I mash them up with a fork and add to my dough. After defrosting they are sitting in liquid - very syrupy so I do not usually add any water. Everything goes into the bowl. 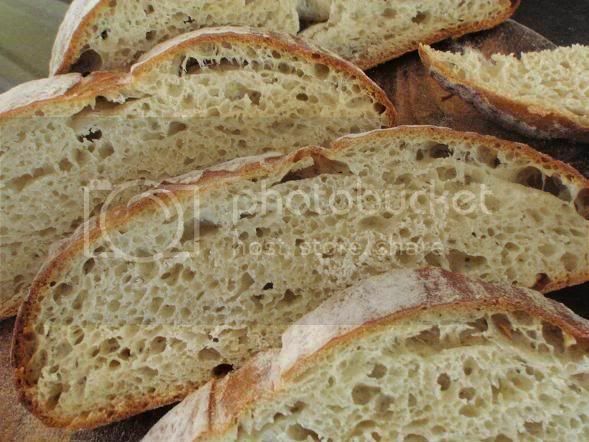 it makes wonderfully moist, delicious, fragrant bread! There was a nice sweetness to the flavor, too.